Tax Refund Warning: Your Bank Account Can Be Garnished! For many of you expecting large tax refunds in the coming weeks, it is an exciting time and always feels good to have a little extra money. However, if you are behind on your bills and have judgments, it is a scary prospect that your tax refund money can be intercepted by a creditor garnishing your bank account. 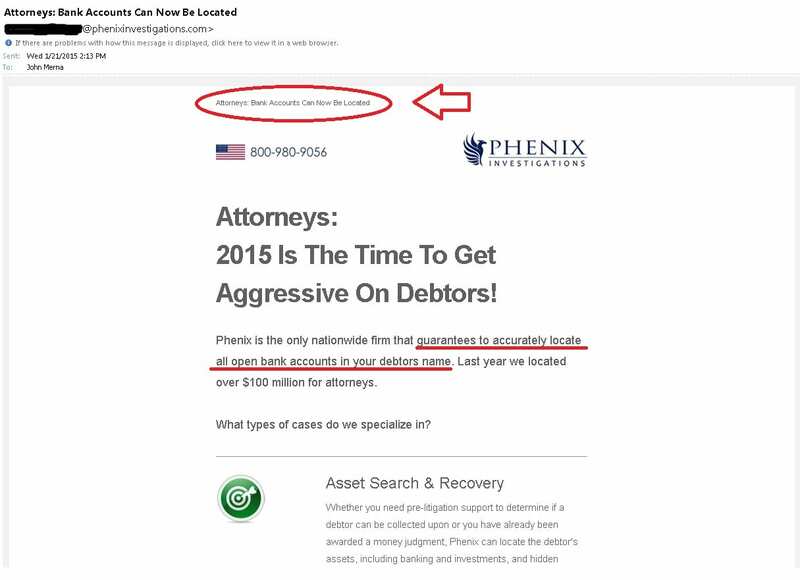 I wanted to share a copy of an unsolicited email advertisement I received this past week from a “skip-tracing” company that assists collection agencies and collection attorneys in locating assets including bank accounts. They boldly assert that “Bank Accounts Can Now Be Located”. The significance of the email goes beyond just it’s content. The timing of it being sent out also telegraphs the risk that tax refund season carries with it for those with unpaid debt, judgments, etc. This company is actively soliciting the business of your creditor to assist in locating your bank account. Tax refund time is like “open season” for collection agencies and collection attorneys. In my experience more garnishments are filed just prior to February/March, the peak of the refund season, in an attempt to trap those refunds when they are deposited into a bank account. Capturing a large tax refund can save the creditor an enormous amount of time and costs. A standard wage garnishment in Virginia only allows the creditor to take 25% of the gross pay. A bank garnishment or levy allows the creditor to take ALL of the money held by that bank in both joint and individual accounts. So you see why judgment creditors are more active during tax time. The first step for those of you contemplating filing a bankruptcy to eliminate or restructure your debt is to hire an affordable, experienced attorney specializing in bankruptcy immediately. Don’t wait until you have your tax refund money in hand because, as you now know, you may never get it if a creditor grabs it from your bank account. Call today to schedule a free, no-obligation bankruptcy consultation to discuss not just how to eliminate your debt but to protect your tax refund. Our attorneys will be able to instruct you on how to better receive your refund without making it vulnerable to being taken. This way you can receive it safely and have the funds available to assist you in getting rid of the debt permanently through a Chapter 7 bankruptcy where the debt is eliminated or a Chapter 13 bankruptcy where it is restructured. The Merna Law Group prides itself on being aware of our clients’ needs and struggles. For this reason, we have investigated and compiled a list of recommend avenues to insure the safe receipt of your tax refund so you can get your bankruptcy filed. When you come in for a free bankruptcy consultation ask your attorney for the informative instruction sheet regarding the proper way to protect the delivery of your tax refund. Give us a call today at 800-662-8813 to schedule your free bankruptcy consultation. We look forward to making sure your tax refund does not become a creditor’s “trophy” this tax season. Our offices also service: Chesapeake, Richmond, Newport News, Hampton, Portsmouth, Norfolk, Chesterfield, Henrico, Tuckahoe, Yorktown, Williamsburg, Suffolk, Virginia Beach, Smithfield, Courtland, Poquoson, Petersburg, Colonial Heights, Fredericksburg. Posted on Virginia Bankruptcy Blog.